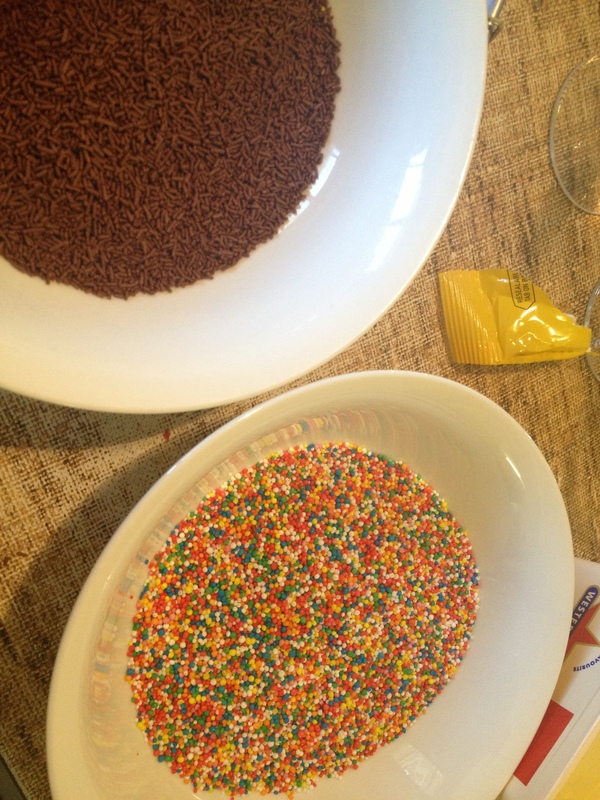 Fairy Bread Recipe – An easy party treat! I try to blog a recipe each week, but being a one-eyed pirate in the remote Outback has certainly proved a challenge on that front. However, I feel quite triumphant! 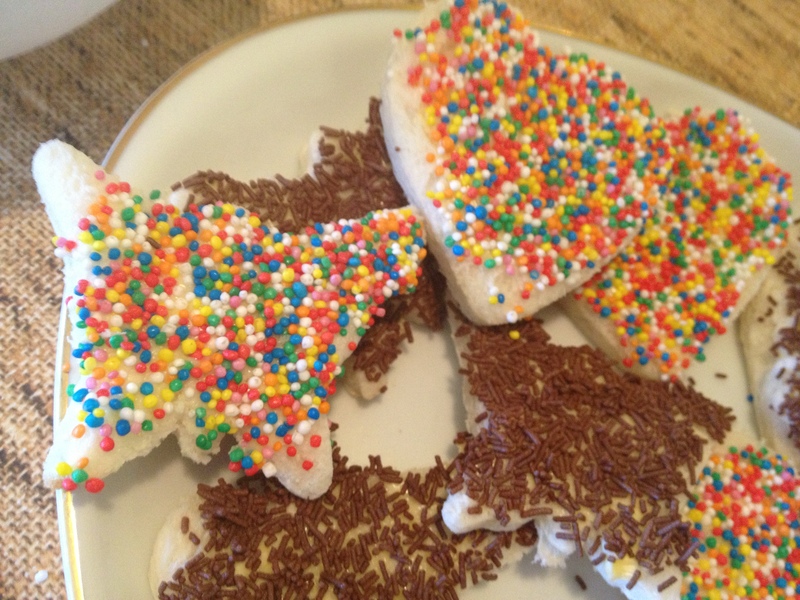 I have managed to make Fairy Bread for a birthday afternoon tea while visiting at a friend’s cattle station, after being faced with limited ingredients at the local store. Fairy Bread was always one of my childhood favourites. Children love it, and I hasten to add that most adults do too! It combines the soft chewy texture of white bread with creamy butter and a good sprinkling of crunchy sweet hundreds and thousands (coloured nonpareils). I also made some with chocolate hail – a kind of sweet chocolate sprinkle that is equally delicious. 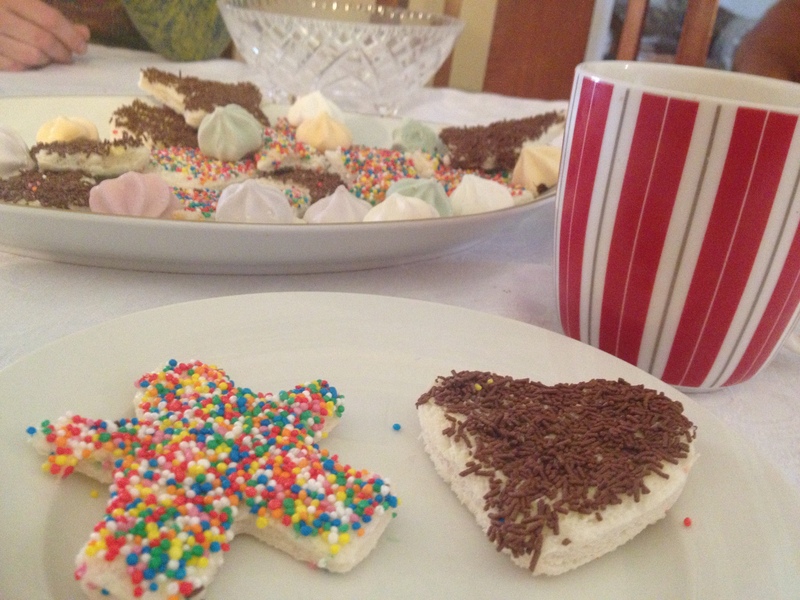 It’s definitely not a health food, but as an occasional treat I highly recommend Fairy Bread – why, even the name is cute! Sliced soft white bread, soft spreadable butter, hundreds and thousands, chocolate hail or similar if desired. Some cookie or bread cutters if you have them. 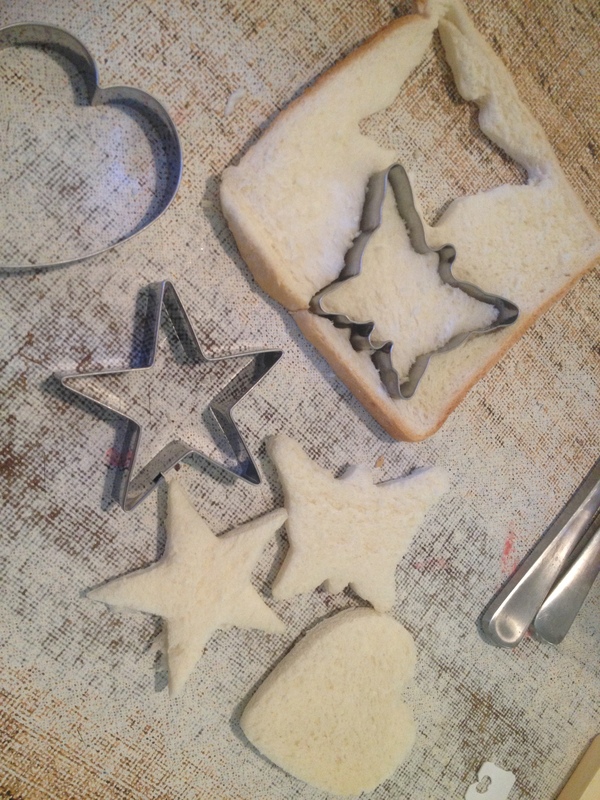 If you have cookie cutters, leave the crusts on your bread, and stamp some shapes from the middle of each piece of bread, trying not to get any of the crust. If you don’t have cookie cutters simply cut the crusts off each slice of bread, and then cut your bread into squares or triangles. Tip your hundreds and thousands or any other toppings into shallow wide bowls. Butter the bread thickly. Then turn it butter side down and press into a bowl of topping. Thank you to my friend, Carly-Jay Metcalfe, for this artful demonstration of technique! Arrange decoratively on a large plate. Feel free to ask children to assist. Older kids love stamping the bread shapes and even littlies can dip the buttered slices to feel like they are helping. 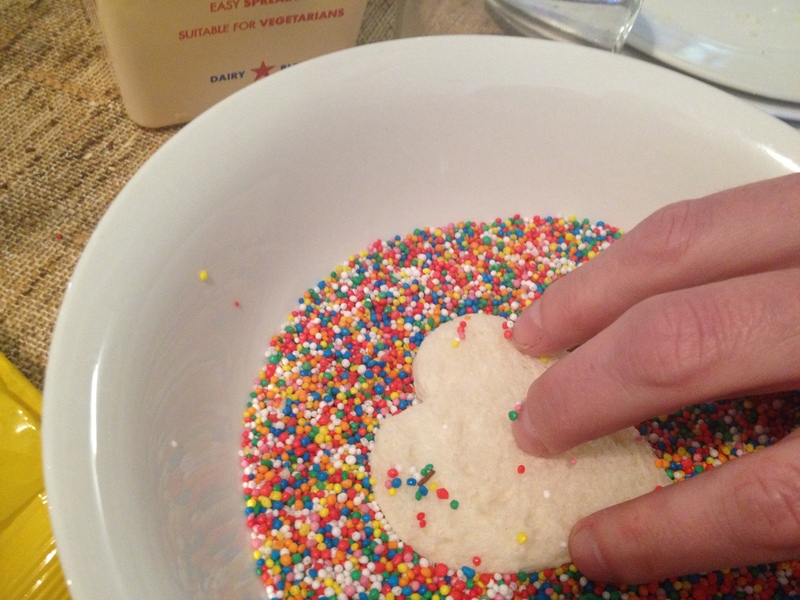 Just make sure SOME of the fairy bread makes it to the plate. Serve with lemonade or a glass of milk for the kids. Adults might like to pair this with a good cup of tea or a glass of pink champagne! This entry was posted in Cakes and desserts, Fast and Fabulous!, Sweet treats and tagged children's party food, fairy bread, food, kids in the kitchen, memories, nostalgia, party food, party treats, recipes for kids by Cauldrons and Cupcakes. Bookmark the permalink. And I suddenly get visions of you and Carly running around, arms outstretched (fairy bread in one hand) chasing each other around the open spaces high on sugar 🙂 Huzzah!! How adorable! What a great idea too. Thank you, Nicole! Smiling cause we also got bread, with lashings of real butter dipped in sugar……and sugary mashed banana on bread and butter….have just been transported back to my Enid Blyton , grazed knees, exploring fields, mucky hands, tom boy, tree climing , singing to the birds youth. There is nothing as clean as mud and nothing as good as fairy sugary bread smothered in butter…enjoy the holiday Nicole.